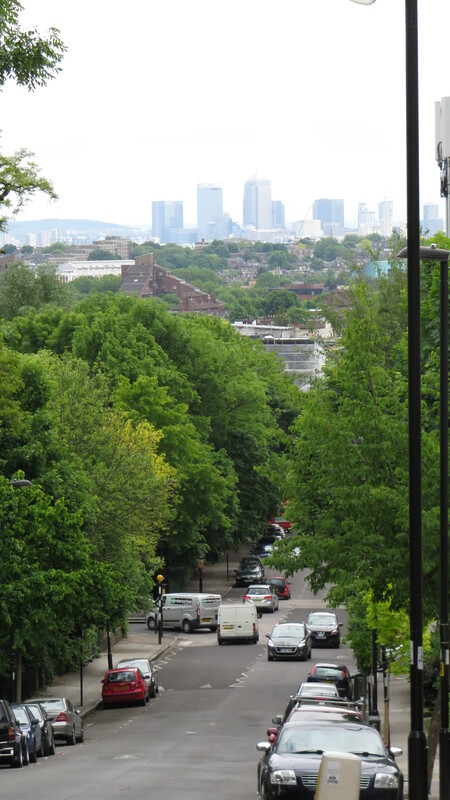 Dear Readers, when I left you last week I had reached the highest point of the North London street tree walk from Paul Wood’s new book ‘London Street Trees: A Guide to the Urban Forest‘. As I walked along Cheverton Road I was struck by the fact that there were no street trees on this stretch of road at all. How bare and exposed it felt! But a little further down, the trees started again, and among them was a whitebeam. I have a great affection for these trees, as I have one in my own garden and value its generous shade. I had never noticed before how twisted the trunks often are, as if the tree had followed the sun in tiny circles when it was young and had not managed to untangle itself. There was some building work going on on the other side of the road, and, when one of the builders saw the camera, he danced across the road like an escapee from ‘Fame’. Unfortunately I failed to capture his moves on my camera, and when asked to repeat them he became as shy as a toddler hiding behind his mum. One has to be ready to take a picture at all times. The view from the other end of Cheverton Road is pretty impressive as well. 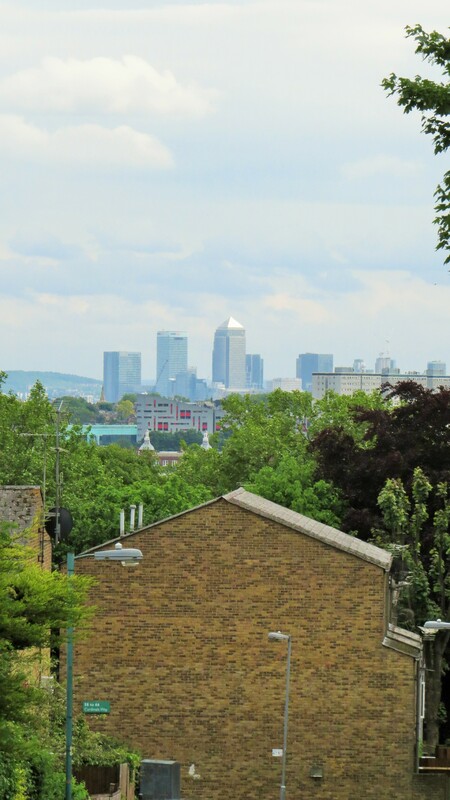 However, my path led me away from the twinkling roofs of Canary Wharf, and towards one of London’s street tree ‘hotspots’, Dresden Road. 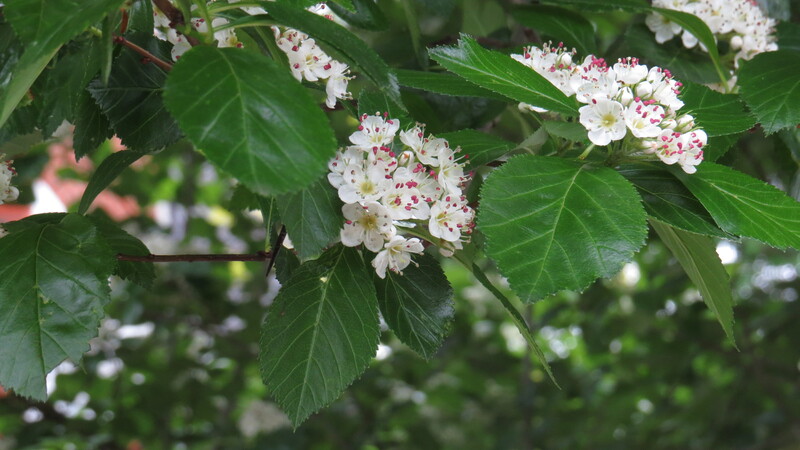 There were some very fine trees, including this broad-leaved cockspur thorn (Crataegus x persimilis ‘Prunifolia). This is a type of hawthorn, one of my very favourite trees, both for its wildlife value and for the way that it heralds the start of summer. I love the pink pollen. 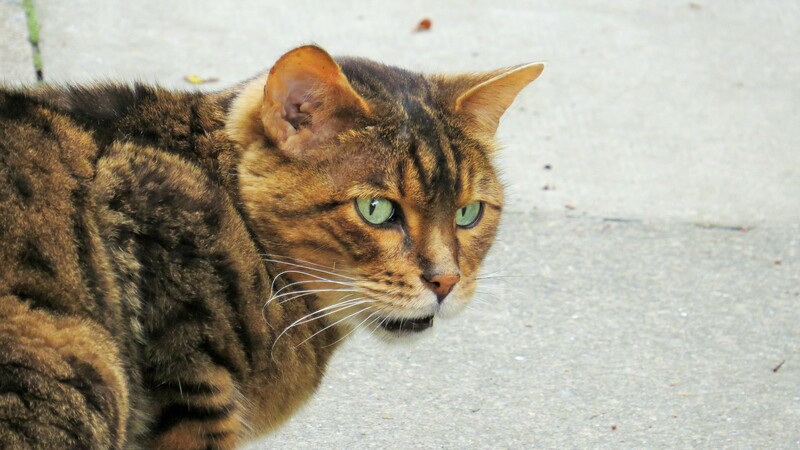 Not far from the tree there was a very fine cat. 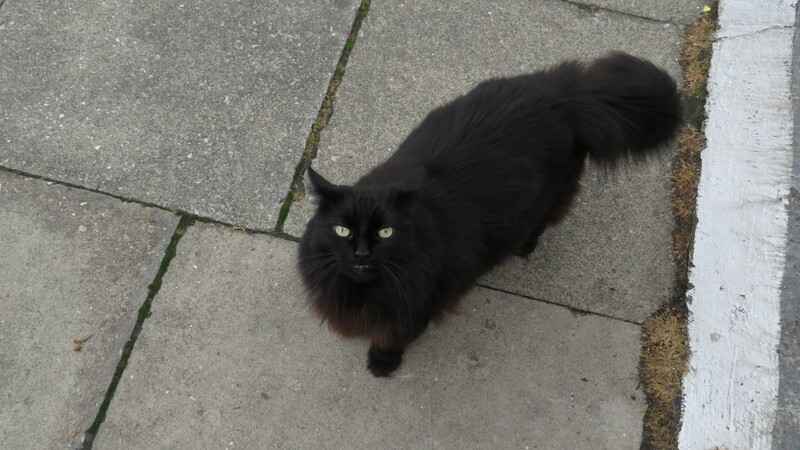 He didn’t want to talk at all but if he had I think that his utterance might not have been very polite. 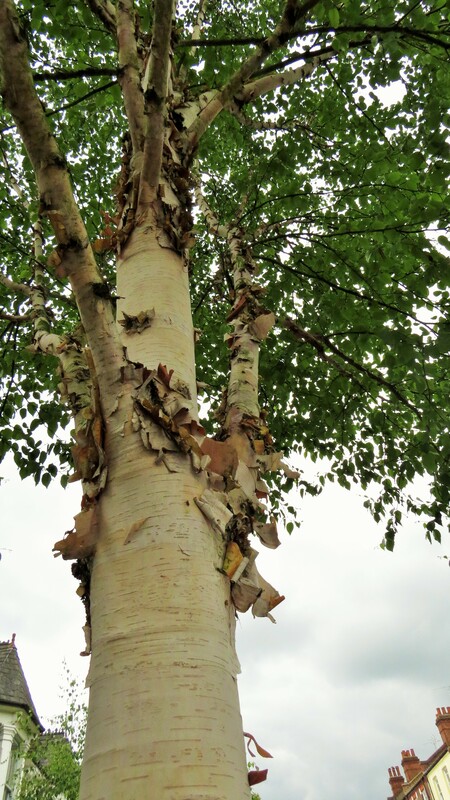 There was beautiful bark on this Chinese Red Birch (Betula albosinensis ‘Fascination’). It reminded me of the curls from a pencil sharpener. 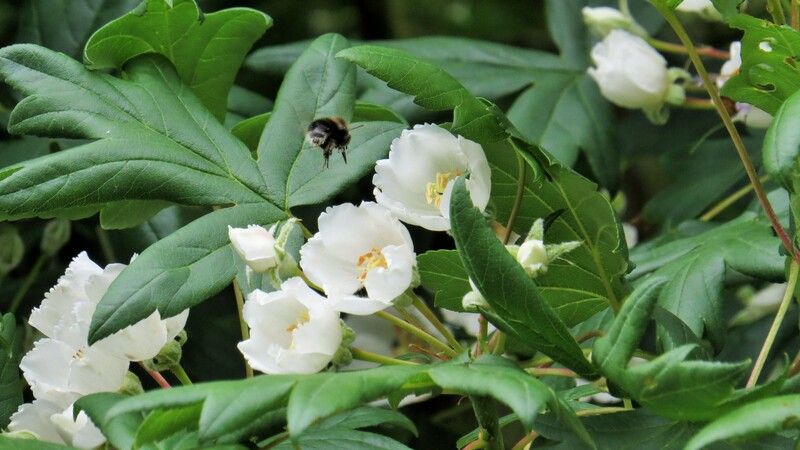 But what is this fine tree, positively abuzz with bees? 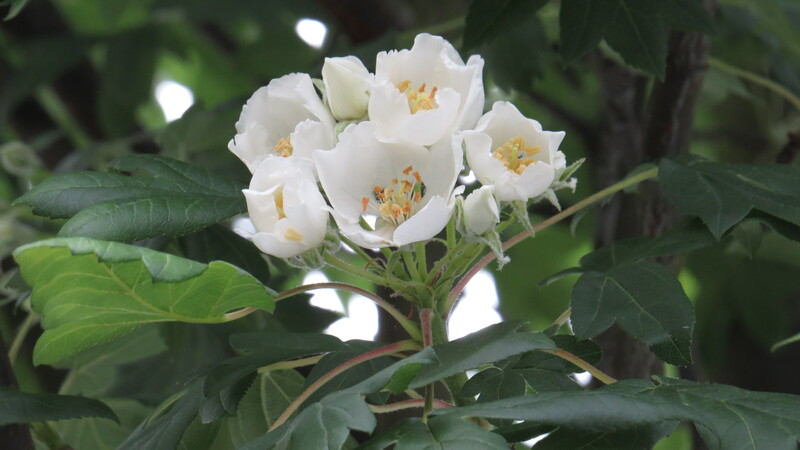 My guide tells me that it’s called Bragania or Erect Crab Apple, and that it’s from the Levant, Anatolia, Thrace, and an arc of the higher altitudes through Israel, Lebanon, Syria and western Turkey with a few isolated pockets in Europe. On Mount Lebanon it grows at altitudes of more than 1000 metres. In the Evros Mountains of Greece it was traditionally safeguarded by local communities for its fruit, but may be forced out when the land comes under pressure. How wonderful to see it as part of the international woodland along Dresden Road (which also includes crepe myrtle from the southern USA, a hankerchief tree from China and a Judas tree from the Eastern Mediterranean). 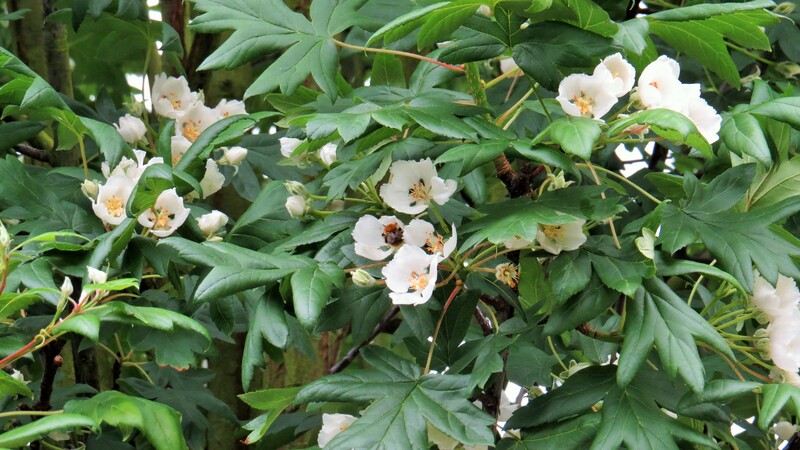 The flowers of Bragania remind me a little of rock roses, and several of the trees were in full flower when I walked past last week. 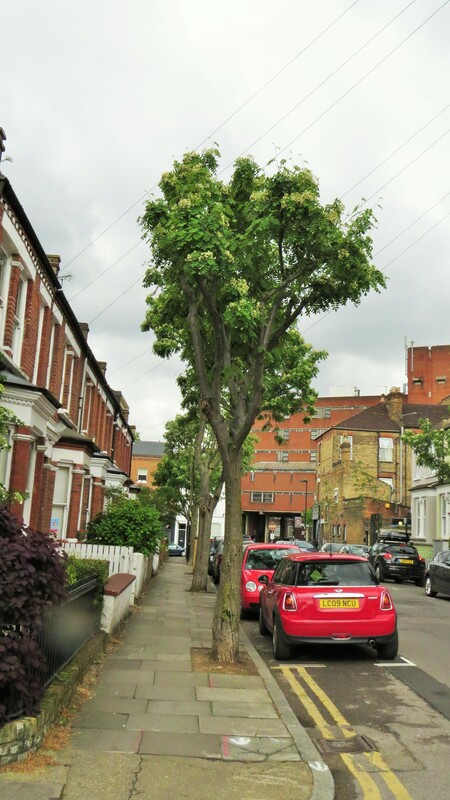 I have already remarked on the extraordinary variety of trees in Dresden Road. 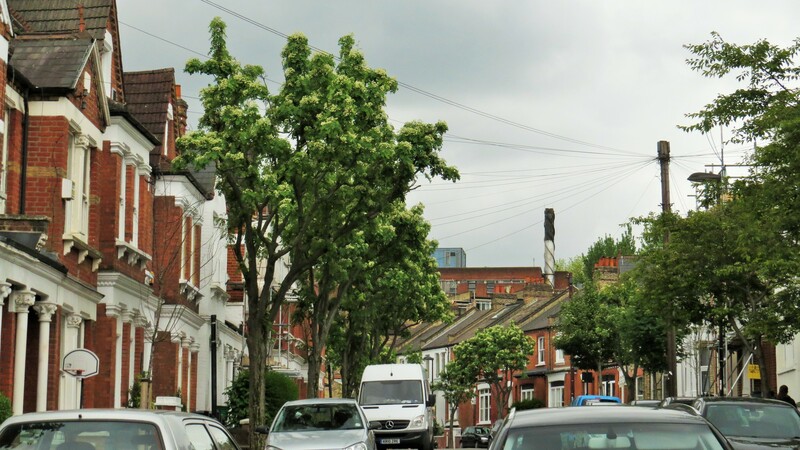 The next few roads, however, show how a planting of a single type of tree can affect the look and feel of the street. The vast majority of the trees on Gladsmuir Road are common limes (Tilia x europea), and how cool they made it seemed. 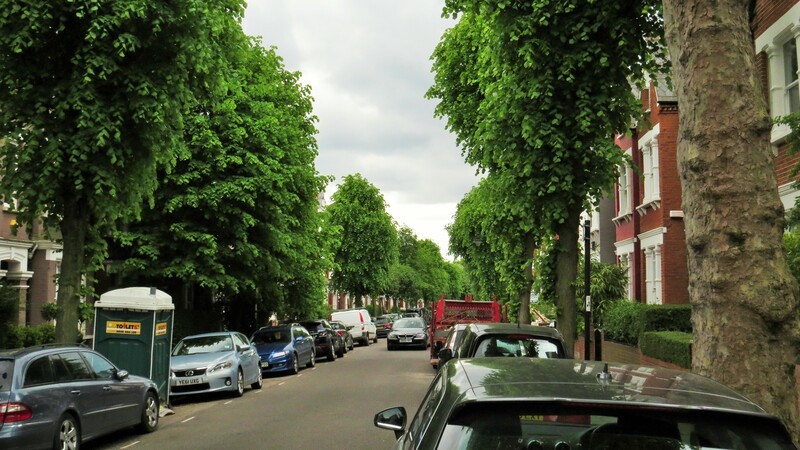 These trees can live in excess of three hundred years, and were the preferred urban planting prior to the London plane, not just in the UK but also in Europe – think of the Unter den Linden in Berlin. The lush vegetation is almost tropical at this time of year, though I wonder how the local car owners like it – the tree is notorious for supporting a fine harvest of aphids, who make a habit of dropping honeydew on anything parked below. 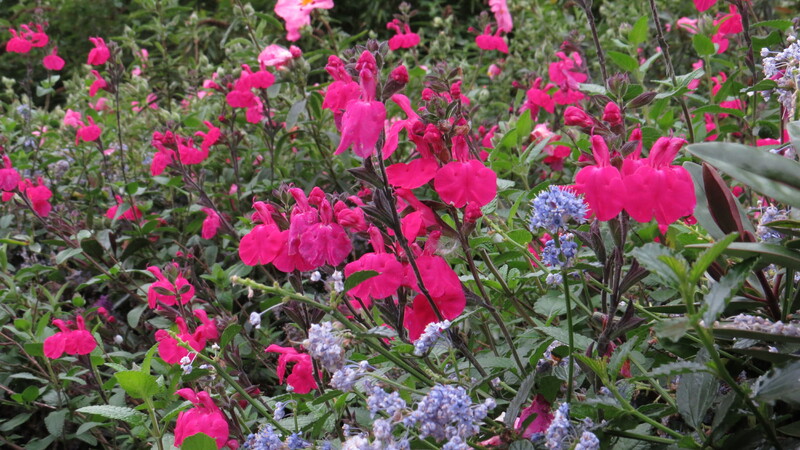 I love the flowers, and the scent, but the pollen is one of the worst offenders for hayfever sufferers. What a lovely hiding spot for small birds, however, and for the many insects that I’m sure will enjoy the leaves. 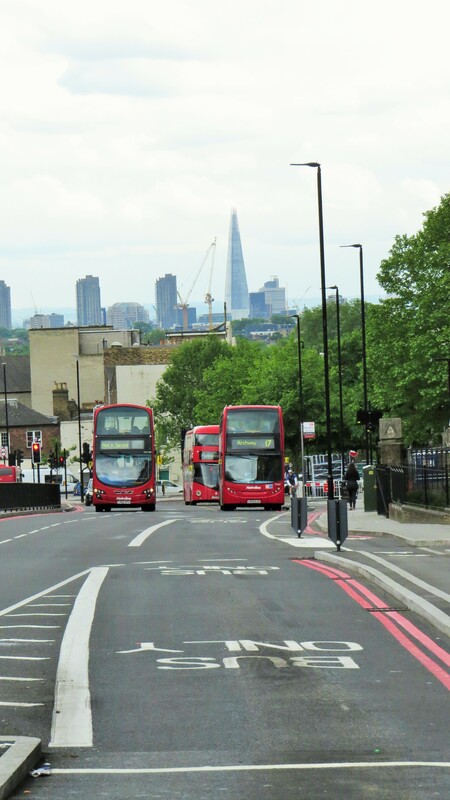 Then it’s a quick trip across the Archway Road (with a brief glance back at The Shard) and into Despard Road, which is also mostly planted with a single tree species, the white-berried rowan(Sorbus aucuparia). This is a tree with airy, ethereal foliage, and fluffy, short-lived flowers. The tree itself is also short-lived, and is usually on its last roots after 25 years. Wood sees it as a safe, but uninspired choice, although no doubt the berries will be much appreciated later in the year. But what I’d come to see was right opposite the main entrance. I hadn’t noticed it during those difficult former visits, though I wish I had. 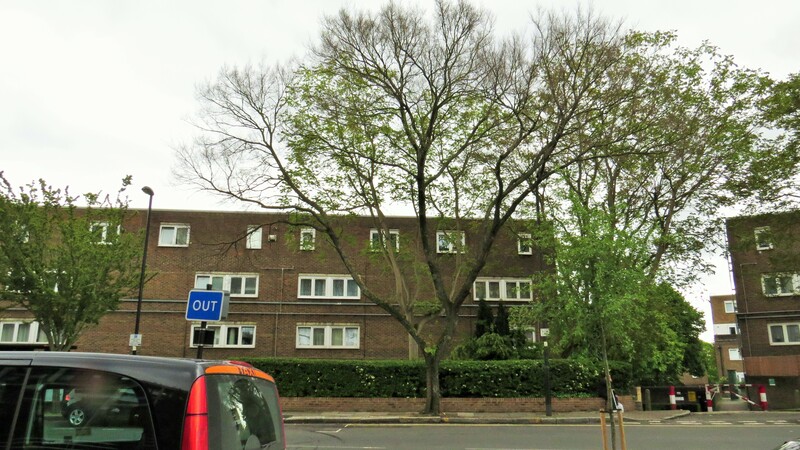 This is the champion Chinese Lacebark Elm in the whole of the UK, the tallest one of all. It looks rather delicate for all its height, especially when a police car with its lights flashing is parked just out of the photograph. How many human dramas has this tree witnessed, I wonder: people bringing home their babies, people who have just said goodbye to their loved ones, people who have received a hopeful diagnosis or crushing bad news. People, like me, laden down with bags and paraphernalia as they ease their mothers or fathers into the taxi which will take their frail but grateful bodies home. All this has swirled around this tree and yet there it stands, unmoved. I find solace in the timescale of great trees, their long slow lives, their deep roots and their seasonal cycles. It reminds me that, compared to some of these great organisms, we are as ephemeral as mayflies. All blog content free to use and share non-commercially, but please link back to the blog, thank you! This entry was posted in London Places, London Plants on May 27, 2017 by Bug Woman. I am quite astonished at the variety of trees! Thank you. Thanks, Paul – I will be keeping an eye on Dresden Road in the months to come. I can’t wait to see how the crepe myrtle fairs. I must revisit the elm on Marylebone High Street and have a look at the Judas Tree there, too…. Nice to see Gladsmuir Road again. I used to visit a German friend there who told me these were linden trees. And not to park your car beneath them! 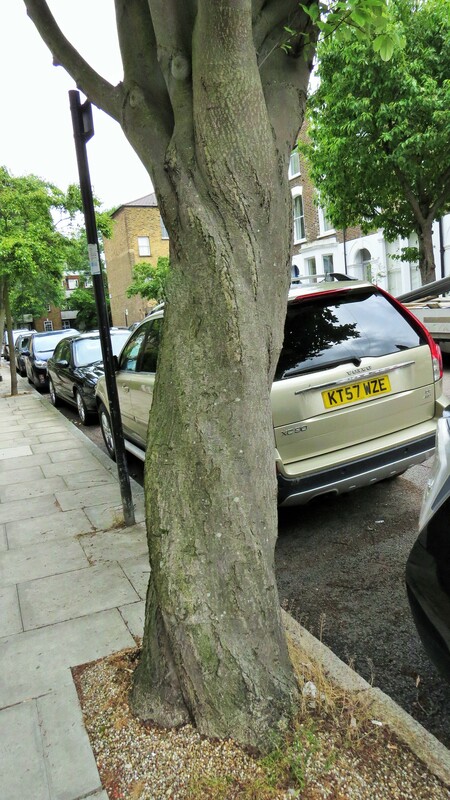 I was so surprised to read that crepe myrtle grows in London. Having taken a chance and planted one in my garden in New York, recently, I now have higher hopes it will survive the similar winter freezes that London has. Would love to see a photo of one in flower if you’re in the area again. 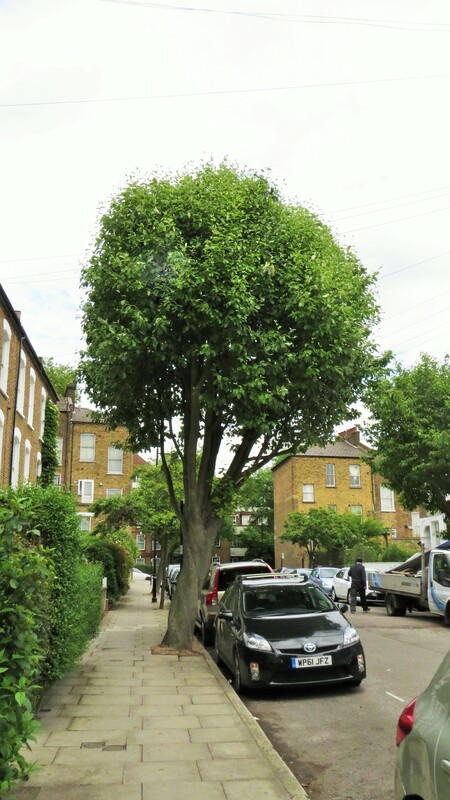 Hi Katya, there’s a lot of planting of more ‘tropical’ trees in London because of climate change, and the belief that trees like the crepe myrtle will do better than previously because we have far fewer hard winters. I shall pop back later in the year to see how the Dresden Road one is doing, it’s just a sapling at the moment but I have high hopes. They are such beautiful trees, I saw them in Washington DC a few years ago and was entranced…. Very interesting post. I think we have been covering the same steps and it is interesting to know the great variety of trees that I have missed along the way.